Traveling and needing to be gluten-free can often be a pain. I try to pack a bag with homemade food on my way out somewhere. That’s the easy part. It’s coming home from Italy or New York or even from Seattle on the ferry that’s the hard part. I’ve been staying somewhere that’s not my home, generally without a kitchen or refrigerator, and I can’t pack bags full of my own food. Long plane flights and traffic can leave me hungry and cranky if I’m not prepared. Sure, there are now plenty of gluten-free treats on the market and in airports. But I don’t want to eat brownies or muffins that often. Why has gluten-free come to mean only baked goods? I would like real food, prepared without preservatives or sugar, food that is really meant to feed me on long airplane rides and when I’m in the car between meals. Thank goodness for Primal Pacs. I first tried Primal Pacs on our flight to Italy in September. Looking for a snack with lots of protein and something guaranteed to be gluten-free, I asked Michelle at Nom Nom Paleo for advice. “Try to find a Primal Pac. They’re made in Seattle!” Luckily, a store near where we were running errands the day before our trip carried them. I snacked on one on our long flight across the Atlantic Ocean. Primal Pacs contain chewy, delicious beef jerky made of grass-fed beef, almonds and macadamia nuts, the loveliest dried mango and cranberries, sweetened with apple juice instead of sugar. This is the best meal-on-the-go I’ve ever eaten. And since they stay fresh for awhile in the sealed bag, I saved one for the long plane ride home. I found myself excited to eat one again. And I was in Italy. This is why we’re happy to announce that Primal Pacs is our latest sponsor. We’ll let them tell you more about themselves. We love how thoughtful everyone at Primal Pacs is about the food they make for us. Why did you invent Primal Pacs? I (Matt) grew up in a ranching family. I got to witness first hand the issues facing cattle ranchers in todays market. Its a tough way to go. I wanted to help make the industry better. Along with that my dad and my uncle made tons of elk, venison and beef jerky from an old family recipe. That stuff was delicious. When I began to adopt a paleo, real-foods focused diet, I wanted to follow the family tradition, but make a version that didnt have any sugar or added sweetener of any time. Thats hard work, let me tell you, but it makes us even prouder of our product. There is no sugar, sweetener, MSG, gluten or artificial ingredients of any kind in our jerky. I havent seen another product out there like ours. Can you tell us about the sources of your ingredients? We take a ton of pride in sourcing our ingredients, especially our organic, grass-fed, grass-finished beef. Like I said, I grew up in a ranching family, so its absolutely key to me to support small ranches that do it right. We only source our meat from ranches that raise their animals humanely and follow sustainable agricultural practices. We work with great organizations like The Western Sustainability Exchange, a group that works with family ranches to help them switch to sustainable agricultural practices so that their livelihood helps the environment and is actually more profitable for them. Little guys cant compete with big CAFO operations, and we certainly dont need any more of those anyway. We have spoken and shaken hands with the ranchers who supply our beef, so weve seen first hand that our beef really is raised on grass and only grass. A lot of beef labels may say grass-fed but you really have to research to get the real story – much of the cattle marketed today as grass-fed spend their time in feed lots being fed large amounts of hay, rice bran, almond hulls, even chicken feces and other assorted feeds that the USDA allows to be called grass. That doesnt cut it for us. The rest of our ingredients – macadamia nuts, raw almonds, apple-juiced sweetened cranberries and dried mango – are also 100% organic. People are always surprised that beef jerky and mango go together, but once they try it, they start asking us if we could sell just the mango. Maybe one day. Why are your products gluten-free, grain-free, and dairy-free? About six years ago, I learned about the Paleo diet from the owner of Urban Crossfit, the Seattle Crossfit gym I attend. The idea of eating foods that our bodies evolved to eat made so much sense to me, and Ive never been healthier or felt or performed better. The gluten free/paleo has dramatically decreased the inflammation and irritable effects I unknowingly was experiencing from my old diet. But finding real, healthy food that you can eat when youre running around, travelling or just too busy to cook is a huge challenge. So I started making Primal Pacs to fill that need. Can you tell us the story of a customer happy with your food? Honestly, its hard to pick just one story because we get so much incredible feedback. We hear from elite athletes who use Primal Pacs to fuel or recover from tough workouts, from firefighters and rescue workers to rely on Primal Pacs for real food options when they are working 24 hour shifts and saving lives, from people just starting to change their diets who are thankful to have a snack option and from busy travellers who thank us for saving them from the horrors of airplane food. But really, the stories that mean the most to us probably come from regular people who are able to feed themselves and their families with nutritious, real food when life gets too hectic. It feels good knowing that you make a difference in everyday lives. Why is the work you do important to you? There are so many reasons why Im so passionate about this product. Like I said, knowing that I can help so many people get access to real food no matter their situation feels pretty good. And running a business that supports family ranches who treat their animals humanely and are good to the environment really inspires me. I could talk about the importance of sustainable agriculture for hours – youd probably need a Primal Pac just to get through my diatribe. Combining those two passions makes me a pretty lucky guy. Primal Pacs is doing a giveaway for 3 lucky winners. Each winner will win a small pack, a large pack, and a jerky-only pack, plus a t-shirt or tank top (winner’s choice). Simply leave a comment here about why this food intrigues you. Thanks, folks. Winners have been chosen and comments now closed. As soon as I read what was in these at the top of the article, I turned to my husband and told him that I had to get some to try for traveling. I’m in the same boat– I pack homemade food going to my destination, but it’s the coming back that’s hard to find food for. And considering that I can’t eat any soy or gums, most gluten free products on the market are ruled out for me too. I would LOVE to try these primal pacs! I travel for a living and nothing compares to Primal Pacs for a go to meal or snack. After getting food poisoning from the majority of the restaurants at the airport, I’m happy to have a better and healthier option. I can’t wait to get some of these for my family. Our granddaughter is Celiac and others in the family are gluten sensitive. My son and daughter in law along with our grandkids are super healthy thanks to paying a lot of attention to their diet and keeping fit with Crossfit. They are busy, busy people and terrific snacks like this would be SO helpful – for after exercise and for a treat for school lunches – and for on the road. I have not had the chance to try PrimalPacs yet, but you can bet I will be trying them! What a great relief to know that there are grass-fed beef options in your jerky (hard to find where I live), and that your Pacs are balanced and “squeaky clean.” I can’t wait to try them,and I hope I’ll be a lucky winner! Even if I’m not, you can bet I’ll be trying your products, as I travel often and have difficulty finding anything beyond the sweet, nutrition-empty GF products. Thank you in advance for doing what you are doing! Yes! I cannot tell you how excited I am that you’ve started blogging more and more about food that is, for lack of a better definition, paleo-oriented. At the beginning of this year, concerned with continuing weight gain and the prevalence of diabetes and metabolic disorders in my family, I decided that I’d just *try* cutting out sugar and starchy foods. I wasn’t trying to lose weight, I just wanted to see how I’d feel. Of course, I’m sure you’ve heard this story numerous times but predictably, I feel great, and look a lot better. The problem with this, as you’ve pointed out in this post, is not cooking at home, or even eating at a friend’s place or at a restaurant, but snacking on the go. I have to be vigilant about packing almonds or yogurt (which I still eat – I don’t strictly adhere to paleo) lest I find myself so hungry I’ll eat the first thing I find for fear of fainting. I don’t normally buy a lot of pre-packaged snack food, but this looks *awesome*. So, thank you! I’ll actually look for this in stores because it sounds perfect for my needs! Wow! I need to find a Bay Area source for these paks! We travel fairly often as a family and I’ve been so conscious lately of the need for protein-rich snacks on the go (my poor body is rebelling against too many meals and sweets eaten out & I long to bring some more balance to my diet when we’re on the road and far from our kitchen). Thanks for introducing this product! Can’t wait to find these! I only eat grass fed beef and have been missing jerky. Love being able to have a snack of good food if I can’t find something good to eat. I have been gluten free for about two years and I always struggle to find snacks if I am out all day. These would be great! While I do love gluten free muffins, I agree that it is frustrating that it is often all one can find. I would love to have them for snacking. These sound great. I am looking forward to trying them and seeing if my local coop will carry them! Thank you, Shauna, for choosin sponsors of such integrity. These sound great. I, too, always wonder why people think that I want a sweet that is gluten-free for a snack. I never ate sweets that much before I discovered I needed to avoid gluten so I don’t need cakes, cookies and brownies now. Thanks for letting us know about this product. I travel regularly, and would love to have truly good food to take with me. So looking forward to trying Primal Pac! My family could definitely benefit from having these snacks around. Thanks to the company for making a product that GF people can enjoy! This is exactly what my husband has been looking for when he travels for work. He recently went grain-free with me, and as a result found out he also has issues with gluten and/or grains. It’s so hard to stick to a healthy diet when he travels. Having to go gluten free meant some big adjustments. No more cheap granola bars on the go, or grabbing fast food. I have been struggling to find something that satisfies. This looks like it would do the trick. I saw someone eating this the other day and have been thinking about it since! I am very intrigued by the Primal Pac. I always grab fruit or some almonds when I’ll be away for a while, but this sounds like something easier and tastier to travel with. Love to try it. I have been looking for something like this. It is so great to have someone who cares about what goes into our body. I have allergies of all kinds so the doctor has me strict diet. This would be the prefect snack. Being on a casein free diet can be challenging at times. It would be so nice to have these Primal Pacs in my purse for those times when my choices for meals are casseroles loaded with cheese or cream of mushroom soup. And if they taste good and are healthy–I am intrigued! These sound great. It’s so hard to find healthy, protein-rich snacks that travel well. I’m off to look for some. I love Primal Pacs! I’m excited to hear that they’re starting to appear in stores! I keep one in the car and one in my purse for when I can’t get a quality meal. This looks great! Snack food is always my downfall when I am trying to eat healthier/cleanier/sustainably. When traveling and starving I always end up going for what ever is available and feeling the worse for it, these seem like an amazing easy alternative! I would love to have these for traveling, what a great idea! These look delicious and I’m always challenged to find protein rather than carbs when traveling. Glad to know about this company. I’m new to the whole gluten-free diet, and I do travel a lot. I will be looking for these to use as meal substitutions when I can’t eat the local fare. I’m always looking for something like this! Can’t wait to try it. I’m excited to hear about these pacs, because my husband and I are taking a trip soon and I was becoming a little dismayed at the small range of wholesome and gluten-free snack options in the store. These look perfect!! Yay! And double yay to hear this is a local Seattle company. I always struggle with good food that’s going to deliver high nutrition and energy not just for travel, but for work (wrangling disasters can make you hungry) and sport. Like the idea of a tasty, healthy, local product. Thanks for pointing us their way. I am still navigating my way through a number of challenging gut issues and would love to try this to see if it helps! Thanks for hosting. One of my earliest childhood memories is eating jerky with my dad and have missed it since not being able to eat glutens and having to moniter my sugars. I look forward to trying Primal Pacs. When I started eating real food I never thought if care about packaged anything again, but after a celiac diagnosis and having to carry food everywhere food that is real, tasty and in a package is now a big part of my life again. This looks great! I have a hard time finding snacks on the go for my two boys who have food allergies. Yay!! So glad that Primal Pacs is your new sponsor! I love them! Perfect for travel and also just busy days around town. They taste like a treat but I don’t feel guilty because I know they’re nourishing and healthy. Yum! These will be perfect for my husband’s long commute home from work. Thanks for introducing me to this product! I have always wished for a better option than protein bars to fuel my teen through their after-school sports and club actvities. 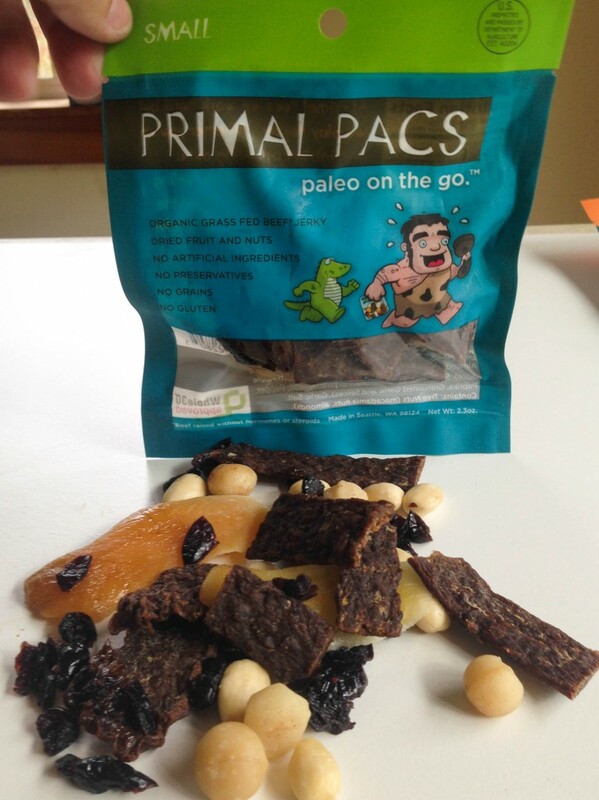 They love beef jerky, so Primal Pacs sound perfect! I’m gonna be going on an overseas trip soon (20+hours travel time each way) and finding food that’s gluten free, portable enough for the flight, AND isn’t too high in carbs is a real challenge! With an intolerance to gluten – and also soy, sesame, oats, casein, sorghum, millet, amaranth and tapioca, these sound like a great solution for when I need a snack on the go. I’m so thankful there are companies out there making real, delicious food! Yum!! These Paleo packs seem prefect for me to try. My food allergies consist of wheat,corn,soy,peanuts & corn so Paleo foods suit me perfectly! I currently work two jobs so packing lunch for 9 – 5 is ok but having something convenient as a safe snack for my night job is almost impossible (malls food courts aren’t too safe for me) These would help me through the last leg of my chaotic day! I was in Whole Foods last night, about an hour from my home, and needed dinner for myself and my children. Do you know, that at that huge “whole foods” market, I couldn’t find anything that was gluten-free or dairy free that wasn’t loaded with sugar? We had apples and carrots for dinner. Wish we had Primal Pacs! I think these would be great for my partner- he’s got celiac and those super processed, sugary, GF snacks don’t sit well with him AT ALL. Oh, and he loves meat. These sound perfect! This looks like a godsend to my fiancé and I — we are gluten free and we travel a lot for our graduate research, often to places where gluten-free gets you a head scratch of puzzlement. Finding food on the go that has enough energy and protein punch to keep us going without tons of sugar or any wheat is incredibly difficult, to say nothing of finding food that meets those requirements and is produced ethically. Primal Pacs looks perfect for the both of us, and we can’t wait to try them! These would be perfect for packing in my WOD bag. I coach classes back to back quite often & these are not only perfect & portable, but also Whole 30 compliant! It is so hard to find anything like this without additives in my area & nice to see a product such as this exists, so this definitely caught my eye. I am so interested in food now and its effects on our bodies. After a major car accident, I have been trying to eat as clean as possible and give my body food that helps it heal itself. Having these packs for on the go would be a real treat. The look amazing! I’m going to be traveling for Christmas and would love some of these snacks for the long plane ride! Oh why couldn’t this have happened three weeks ago! I am 17 weeks pregnant, and next week my husband and I are flying to Malaysia to help move my dad home. My parents have been missionaries there for the last 5 years and my mother died in February. We are excited but I am obsessing over snacks. This stuff looks amazing. Oh this sounds awesome. I’m traveling right now and would love to have a primal pack to eat. I feel so empty and grumpy! I have recently switched to a paleo diet in August of this year. I am currently pregnant and due in early December. Real food is very important to me so that I can nourish my body and give my baby the best possible start. I would love to win this giveaway and bring primal pacs with me to the hospital! I hope to see these in a store near me soon! Perfect for keeping in the purse for myself and my daughter. I have gradually been switching to a primal diet and love the pure ingredients in these Primal Pacs. Will definitely be giving them a try! I’ve just recently started following a paleo-style way of eating that seems to work for me. My body doesn’t love a lot of carbohydrates, and replacing snacks that are full of carbs can be tricky. I’d love to try these Primal Pacs – they sound like they have a great balance of flavors and nutrition. These look great! Are they available in Canada? Having just spent three out of the four past weeks on the road for work, I know how hard it is to get enough to eat on the road when you’re eating gluten free. I usually do ok for the first few days with my stash but it gets difficult after that. I will certainly look for this before my next trip. My go to snack at work. I LOVE Primal Pacs!! This is something I will definitely try. Looks delicious! My young daughter and I can spend a who day away from our home and I usually pack food with us because I never buy fast food or processed food. On the occasions I get lazy, it’s always a chore to find good food for us to eat. These packs of food seem to be exactly what we need to keep going and nourish our bodies. The ingredients are what intrigue me about this product! I am just trying to imagine that combination of things I love but have never had all together! Plus, I like the story behind the product. Going to look for where I can get them in my area… now! Thanks! This looks delicious! Would love the opportunity to give this a try! Thank you for sharing this product. I have been trying to find some jerky without sugar and extras for my boyfriend for quite a while. With his intolerance to cane sugar, my issues with dairy and wheat and both of doing lower carb diets, snacks out have been a challenge! I think this might just make a perfect Christmas present! This is also the first post I have ever made on your site, but I wanted to add that I have been following your posts and thoroughly enjoy reading them and the insight you have provided in avoiding gluten. In fact, when I started trying to find help to get around having to avoid wheat/gluten, yours was the first I found (I still remember coming across your pretzel recipe and being so excited!). Thanks for all of your hard work. I hope I can find these close to home. Great idea!!!!! Being gluten free, dairy free, MSG sensitive, and having blood sugar issues, it’s really hard, yet really important, to find high-protein snacks that aren’t loaded with protein isolates and other junk. These look awesome! I am excited to learn about Primal Pacs! Allergic to wheat, soy, & sugar and being pre-diabetic, I need a good combo of protein and good carbs. Eating on the go is always a problem. I will definitely try these to be prepared for my next trip. I am more than intrigued! I am excited to try them. I seem to spend an inordinate amount of time these days trying to put together snacks that I can carry with me throughout the day. The idea of getting caught somewhere without something safe to eat terrifies me (Someone please tell me that this is normal for a Celiac newb and that it gets better! 🙂 ) So I usually end up loading down my purse with little mason jars filled with leftovers, which is no hardship but can be very heavy and/or messy. These look tidy, healthy and lightweight. Joy! Holy cow, this sounds excellent! Am searching them out, NOW!! Thank you!!! I’ve only recently discovered that my health requires a gluten free lifestyle. My husband and I are traveling to Argentina for our honeymoon soon and I’m already stressed about what I’ll be able to eat during such long hours of traveling. This is the first time I’ve heard of Primal Pacs but I’m really excited to give them a try! I’d love the peace of mind of knowing that no matter where we’re traveling, I can have a healthy snack without worrying about getting sick. Having recently had to go grain free, I’ve got to try this out. When I’m on the go, I get hangry! A girl can only eat so much almond butter! My 12 year old daughter with celiac diseases just today mentioned that she really wants a jerky she can have for a school snack to help make it through the long school day. I checked my email to find this posting about just the right food for her!! Serendipitous?! Perfect! Hope we win a sample! My husband loves beef jerky (I quite like it myself) but we almost never buy it, because it’s hard to find grass-fed, gluten-free, good beef jerky. I recently went gluten-free a few months ago and have pretty much given up on buying snacks on the go. This sounds like the perfect solution. Thanks for the recommendation, Shauna! I love the idea of having a jerky snack that is more than just jerky. The mix of meat, fruit, and nuts sounds scrumptious! My husband likes to take jerky when he goes fishing. I’ve never liked the ingredients listed in traditional jerky. This sounds like a great option! I’d love to try Primal Pacs! I discovered the primal way of eating a year or so ago after being gf for 3+ years and realizing that wasn’t the cure-all for my digestive issues, and just recently started eating primal the majority of the time. Where I fall short often is in snack foods, so I’d love to find a great product that I could have on hand, and this sounds like an ideal candidate! on the go snacks are tricky and good primal jerky is so hard to find. sounds like snack pack heaven to me…long flight or not. I have the same problem when traveling! I always bring food with me when I go places, and try to make sure to save some sort of snack for the way back, but sometimes that is just a bit of fruit leather or some cookies. It would be great to try something that feels more like a meal! It is so hard to find sugar free jerky! These look great! Sure would’ve helped on several long business trips! Beef jerky with fruit and nuts…now that sounds interesting! I can honestly say I haven’t had a piece of beef jerky since being gluten free but Primal Pacs is just what I want for some traveling at the end of this month! Thanks for sharing information on this product! Oh my gosh! I could pack a bag in my daughter’s backpack for her to eat after basketball practice! How brilliant is this product? It’s a lifesaver for us moms who rack our brains coming up with healthy snack ideas for after sports. Oh, I am so happy to learn about these, Shauna! I get so tired of the same old travel snacks that I always pack – homemade granola bars, roasted almonds, hard boiled egg…I’m always looking for new things to toss in my bag for work trips. I’m going to order up a few of these for my next trip in a couple weeks! Thanks for always connecting your community with great partners! Awesome! My boys have been asking to tryjerky and I could not find any with ingredients I was happy with -until reading this. Thanks! Wow, this company sounds pretty cool. I grew up eating wild game and I want to knowWHERE the animals I do eat are coming from, how they were treated. Thankfully, finding grass-fed non-CAFO meats is becoming easier, and well hey, a fun little pack with macadamia nuts and jerky?!! Yum! This product intrigues me because I’ve never thought of combining jerky with nuts and fruit before. Sounds tasty! Love that its portable! You sold me on this when I read sugar free jerky with nuts and fruit. I think this would be a great gift for a celiac friend of mine who is always on the go. Thanks for telling us about this product. This would be so perfect for traveling. I recently flew 15 hours across the Pacific on an airline that failed to provide the gluten-free meals that had been ordered. This would have been so much better than the snacks I had packed. Sounds much better for travel and emergency food than what I had for my recent travels which had way too much sugar and salt. I am so excited to learn about Primal Pacs! I am just recently adapted to a gluten-free lifestyle and aiming to transition to a paleo lifestyle. My long days (and occasional lack of preparation) leave me missing meals from time to time. These snacks sound like the perfect solution. These packs would be perfect for my husband and I. We are regularly on the go and it is near impossible to find healthy, gluten-free options when in foreign lands….and sometimes even close to home. Having a supply of these ready to throw in my bag would be a fantastic option, whether heading out on a big trip or as an emergency stash! These sound fantastic for the long car rides we make to visit family. It’s so hard to find something to eat along the way that a 3-year-old will tolerate. I now know the locations of the single 5 Guys between D.C. and southern Ohio. Jerky sounds pretty good instead. Thanks for the giveaway. This looks great! I was just reading labels on beef jerky in the grocery store, and I was disappointed to realize that it all has added sugar. I would love to try this! Just purchased my first order! Can’t wait! This is so great! i have the hardest time finding anything to eat on the go and travel for work constantly! When I read the top half of this blog I thought, “what a great idea, but it’ll probably be really expensive”. But when I looked at the website, I was pleasantly surprised! As a registered dietitian, a lot of my paleo clients ask about the best snacks. I usually recommend nuts, dried fruit, or jerky, but quality stuff (grass fed jerky, dried fruit not sweetened with tons of sugar) can get pricy and be harder to find in the city. I love that for just $3.50 per (small) pack, someone can get 240 calories, 24 g protein, and 14 g carbs and fat in what looks like a delicious snack. These would be great when you’re hungry on the go, or to split up half before a workout and half after. I’m intrigued by the use these might have as CrossFit competition or training fuel and as a post run snack for runners. I have been reading a lot about paleo and while I feel that it is not from me (I am from Northern Europe, bread, especially rye bread is something I don’t want to give up), I love the clean and unsweetened aspect. We eat paleo style dinners maybe about three times a week . I would love to try the snacks. My daughter does flying trapeze and nutrient dense snacks before and after are a must. I spend a lot of time in my car and often need to have meals on the go. I will definitely be looking for these snacks and can’t wait to try them. Sounds delicious! I think Primal Pacs are great!! Just wish it wasn’t so hard to get them in Canada! Food snacks for travel that aren’t just sweets? Sounds perfect. My husband recently learned he had to be gluten-free. I have devoured all of your books, and yet traveling – which we do pretty often – remains the scourge of our GF lives. The options available at 99% of airports are so unhealthy, and it is such a struggle to get something that both nourishes and sustains us. I am very eager to try these! Food based, easily portable, gluten free and it contains protein…I’m sold. Once my feet hit the ground in the morning I’m off and running, Primal Pacs would be great to keep in my purse or desk at work for those days when I just don’t have it together. Thanks! Tried a similar product once…love! Really appreciate the commitment to humane animal practices. I’ve been vegan for the past 2 years, but have very recently decided to bring meat back into my diet. It’s really important for me to know from where my food comes. I appreciate that Primal Pacs does, too. These sound awesome! I’ve really wanted to try them for awhile, it’s hard to find travel ready snacks on this diet. These sound like they would be great! As a celiac who was also 10-year vegan, I have been slowly taking on the principles of the paleo diet to improve my health. Primal Pacs would be a great help in this effort!!! Would love to try these for myself and my granddaughters! I’m not gluten free or paleo. I eat plenty of real food though, and I love beef jerky. These would be perfect to snack on while I’m on my feet all day at work. I usually make my own paleo “pacs” when I travel. This looks like an awesome convenient option. and local, too! I’ll have to look for them next time I’m out searching for a snack. Primal Pacs are awesome! I travel a lot for work, and these are perfect. After recently being diagnosed with diabetes, I had to make a lifestyle change. Getting into crossfit community and going Paleo has really challenged me for the better. Primal Pacs have been my go to quick fix as of late, and I’m glad to see hear they are your new sponsors. So hard to find travel food. Would love to try them. Good food to snack on is always a challenge. This would solve it for me. Plus who doesn’t like jerky. Mmmm, would love an opportunity to try these pacs! I’m in Canada and haven’t seen these around. Sounds like a truly thoughtful mixture. It really is hard to find a high protein, nutritious, and delicious purse snack. Thanks for introducing this great product! I try to pack snacks for road trips, but flying is more challenging. These will be perfect for throwing in a carry on so I’ll always have a snack option. These pacs would be great for an afternoon snack while crunching numbers in the office! As a medical student spending most hours of the day, I’m always looking for quick grab snacks but even places of healing I have the hardest time finding much other than vending machine crud! I’m fascinated at this gf combo and would love to see if it could get me through a long day in the OR! Thanks! These would be great to stow in my sons’ school packs for emergency meals. Somehow beef jerky makes a snack seem more legit. I’m intrigued with Primal Pacs because the only safe-ish jerky we’ve found is Orberto naturals (gluten free), and it leaves a really unpleasant aftertaste. As for trail mix, forget it…they all have peanuts. This would be a great product to try! I find these intriguing because they look like they would be a great on-the-go snack while we are at school. We are a gluten free/dairy free Montanan family of five. So these are SO up our alley. Can’t wait to give them a try! Looks like they’ll be must on the ski hill! Food allergies plus other issues, these sound great! damn primal pacs! I can’t stop eating them and they are so easy to travel with. I started recommending it to all my training clients as a snack to go to instead the usual super processed choices. Keep up the good work guys. I love beef jerky but only eat homemade because of the squickness of packaged kind. Would love to try Primal Pacs. These sound great! We are a gluten free/dairy free household and finding snacks that suit our needs while out and about is challenging. It would be nice to have something convenient to take along with us instead of having to make something every time. Sometimes I need a break too! I have been looking for something like this for a while. I have been gluten free and dairy free for almost a decade, and have gradually found better sources of meat for my family and I – not before I got breast cancer, however. I have used conventional and alternative therapys, but when I first began to fight it, I became a vegetarian (I’ve never been one before) thinking it might help me clean up my body, etc . . . but it weakened me. I learned about the paleo diet from a book at the library, and since starting that diet, my cancer has shunk more than 50% in just a few months! I haven’t checked into this blog for awhile since I’m not using grains, but it is delightful to read the stories here, so I checked back in and get this hot tip! Shauna and Danny, do you have any almond flour recipes??? A jerky that is made without sugar is so hard to find. Yay! I work in a public school and often have to spend my lunch or break times with students. Packs like this would be amazing to have for the days that I don’t have a chance to eat a real meal until 2:30 pm. This food sounds amazing! Most of the time I end up not eating because I can’t find anything palatable when I am out and about at doctor appointments etc with my kids. I can’t wait to try these Primal Pacs. Yay! No more icky bananas for “lunch”. I can’t think of a better combo — grass fed jerky (no sugar! ), dried fruit, and nuts. I’d love to try it! I’m a teacher and am always on the run. This would be a great way to refuel. Primal Pacs are a staple in my house! Not only great for travel but I always keep a few packs in my office and my purse for those unexpected times I get caught without a healthy meal. Everyday I continue to be pleasantly surprised by the wonderful foods I find to eat gluten free! I love Paleo Pacs. I think they were the reason I could get through Whole 30 without loosing my mind. If you haven’t tried them pick some up! Look like a great real snack. Love ot try as I love jerky but usually just make my own. I am super excited to find your site here as I stumbled on it from Primal Pacs actually. These look great for traveling!! I would love to win! Thank you for the give-away!!! I’ve wanted to try Primal Pacs for a while. They look delicious and I love a good Paleo snack! What a great giveaway! I have been looking for a snack like this for awhile now. I can find gluten free items, but Shauna, you’re so right….most GF items are some kind of baked good with lots of sugar. That won’t work for me. you just don’t have the time or the right items on hand. To have Primal Pacs on hand would be perfect. Where can I find them? I live in Michigan, outside the Detroit area. Would love to be able to purchase some. I’ll have to start looking in my local stores for these products. They look ideal for stowing in my purse. I usually keep,something in there for the kids or I when we’re on the go, and these seem like they have a lot of energy without the sugar and fat other quick,foods,do. Thanks for spotlighting them. I wish I had something more profound to say, but to me it’s so simple. I absolutely love your products and feel good about what I’m putting into my body every time I snack on a primal pac!They’ve traveled with us around the world! I really love the way that eating clean makes me feel. I feel like I have more energy and the ability to accomplish everything I need to, and still have some gas in the tank at the end to do the things I love. Primal pacs help in the in between times when I don’t have food available to me. We are primal and after searching for convenient snacks/lunches to pack for my gluten-free/dairy-free son, I’ve found it is very hard to find items that are not loaded with sugar or jerky that isn’t flavored with gluten containing soy sauce. These look perfect! Love primal pacs as an on the go mama of two. This is good fuel! I’d never heard of Primal Pacs before now. I was searching for gluten free living (I suspect my eczema is a result of a gluten intolerance) and stumbled on this blog. I’d love to try these Pacs as I hate to have to think about my food. Gluten free, sugar free beef jerky? What’s not likable about that? With all the traveling I do and having had to pay $14. for a gluten free sandwich the last time I had a breakdown in the airport these sound like a great idea! These are such a great idea!!! would love to win this prize. I am always looking for REAL food when I’m on the go. Trail mix is great and easily portable but the addition of jerky makes Primal Packs seem more like a satisfying munch than a less-than-ideal nosh. Thanks to Matt and your team for bringing these to market, and thanks to Shauna for introducing this new product (well, new to me at least :))! Wow, What a fantastic idea. Healthy gluten and sugar free nutritious food. Would be fantastic for trips and they sound delicious! love it! I am always on the look out for more protein rich snacks. My kids would love this and the combo of beef, fruit and nuts sounds SO good! just placed an order. i eat gluten free and dairy free; i’m very active and always on the go. i like to keep healthy snacks on hand so i can make good choices even when i didn’t plan ahead. these sound great! Best idea I’ve seen in a long time. Now I’m hungry! I would love to look into trying the Paleo diet. This may be my jump start! I am officially on the hunt for these…they look like they would have been a great option for my 12 hour flight earlier this week. Ohhhh Soy free beef jerky!! I just ordered 5 large packs of the jerky/nut/fruit mix! Intrigued? I’d say elated to find a food created to meet the needs of so many who have fewer options when on the run. I am very passionate about sustainability and the choices we make to support that. You made it easy. Your passion about organic, local and humane ranching is so appreciated, thank you for being responsible in choosing your suppliers. I chose to go wheat free 2 months ago, not because i had to but because i chose to….based on what wheat has become…might i add that i feel so much better and glad that i did. I cant wait to try your packs. Now I’ll have a go to food that supports my energy and the energy of the planet. Thank you! Please consider me for the sample pack! I NEED THIS! Last year I started a Paleoish approach to eating and was looking and feeling amazing. However, my husband was diagnosed with Stage IV cancer this summer. Most of the last 4 months have been spent as a caretaker after brain surgeries and sleeping in hospital chairs. I’ve given up on taking care of myself. However, we have a little girl in kindergarten who deserves a healthy mama and who needs to grasp the importance of taking care of one’s body. Get me back on track, please ?! Food that is not poison, but meant to nurture. Good. I’m constantly on the go. I work 2 jobs and my husband is a chef (working crazy hours). We are getting ready for our first vacation in several years (to Disneyworld). I’ve been looking for some healthy, GL, tasty snacks to take with us and just to have when I’m traveling. This is a great opportunity to try something new – thanks for having the promotion. Count me in! I’d love to try these!! We are gluten free for my kids and moving towards paleo! My husband loves jerky and I’m always looking for a healthier version to buy him. This would also make a great snack when we are on the go – that I can eat too!